Somalia achieved independence only in 1960, and major general Said Barre took power in a coup in 1969. 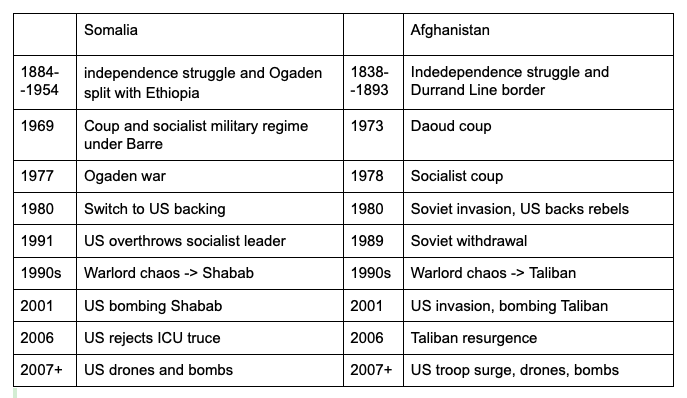 By the 1970s, Somalia was prospering, free of British/ Italian ‘protection’, socialist, a model third world state from the Soviet point of view, not yet targeted by the US. Ethiopia had a Nasser-like military coup in 1974 promising socialism next door. Sudan was at peace and pursuing a Nasserist policy under Colonel Gaafar Nimeiri. Nkrumah’s dream of a united socialist Africa looked like it might actually be coming true. Somalia has a population of 12.3m vs Afghanistan’s 32m. It has one of the most illustrious histories among Muslim states, prosperous for thousands of years as a trading nation perched on the strategic Horn of Africa, an early convert to Islam. As with all of Africa, it went into sharp decline in the late 19th century, after the Berlin conference of 1884, when European powers began the “Scramble for Africa”. In the last heroic resistance to imperialism, the Dervish leader Mohammed Abdullah Hassan rallied support from across the Horn of Africa and begin one of the longest colonial resistance wars (20 years). 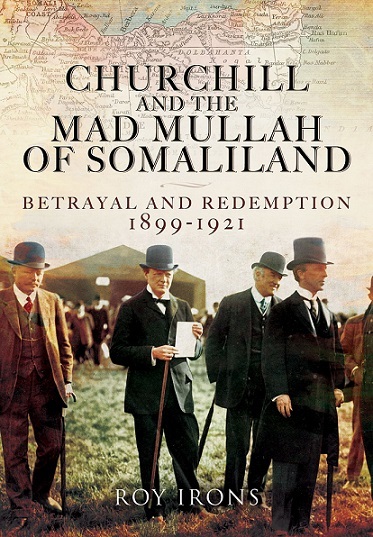 Hassan emphasized that the British “have destroyed our religion and made our children their children” and that the Christian Ethiopians in league with the British were bent upon plundering the political and religious freedom of the Somali nation.” While all other Muslim states fell to Christian invaders, Somalia held out. Britain and Italy, the ‘protectors’ of Somalia, had no say in the matter. The colonial border was a line right through the middle of Ogaden, populated mostly by Somalis, made by actors in London, Rome and Washington. When Somalia finally achieved independence in 1960, it was left a time bomb ticking on the border with Ethiopia. Pashtunistan and the Durand line created a burning resentment that prompted the Afghan Shah’s cousin Daoud to oust him. But the Soviets were not interested in supporting a war with Pakistan. They were playing the ‘great game’ by detente rules. So the nationalist Daoud turned against the Afghan communists, prompting them to carry out a coup in 1978. This created the conditions for civil war and their overthrow. Like the Afghan Taliban, the Somali taliban (Shabab) are still strong, the US refusing to give either a place at the table, instead bombing them. The opportunity presented itself in Somalia in 2006, when the Islamic Courts Union (ICU), a coalition of Islamists including Shabab coalesced, but the US nixxed it (‘we don’t negotiate with terrorists.’). In 2009, a colourful Somali emigre, Mohammad (Tarzan) Nur was appointed mayor of Mogadishu. 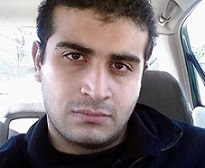 He was disappointed that the US refused to let the ICU function. “The ICU are the right people to make peace in Somalia. No more clan rubbish.” Like Karzai in Afghanistan in the 1990s, he was willing to work with ICU and their ‘student’ allies, despite their radical Salafism, and hoped to be a bridge with the West, where he had established himself and his family. 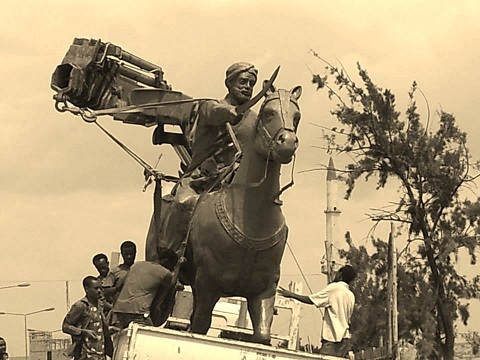 Finally, the warlords packed up and left Mogadishu two months after the festival debacle, and Nur was able to rebuild the power grid, pave roads, build schools, create a modest nightlife for Somalia’s capital. Mogadishu mayor Nur was not corrupt, like Karzai (jokingly referred to as the ‘mayor of Kabul’), And he was not handicapped by US troops on street corners and making night raids. His success as mayor is grounds for hope. Imperialism is not ‘the only alternative’.